Was Harry Kane’s August that bad (through numbers)? As we all know, Harry Kane doesn’t score in August. This year he kept his poor run going and, as if to emphasise the point, come the first day of September the goals arrived. But leaving media narratives aside, has he really played badly in his three Premier League starts so far? Or has he just been a bit unlucky? Goals are few and far between in football, and in a small sample size they don’t give a fair reflection of performance. Shots are more numerous and will give a better idea of whether Kane was really a threat in the three games thus far. Well that looks ok! He may not have scored but Kane is out-shooting the rest of the Premier League by a fair way. The problem is, looking at shot numbers can be deceptive as not all shots are created equal. A 35 yard punt is obviously not worth the same as a tap in from six yards. I’m guessing Christian Eriksen’s appearance in the list comes from more of the former and less of the latter. Expected goals helps us address this problem. Here, rather than just counting shots, they are weighted based on their probability of being scored. The list has changed. Out have gone long range shot-takers, like Pogba and Eriksen. In have come poachers who generally find themselves further forward, like Alli and Jesus. 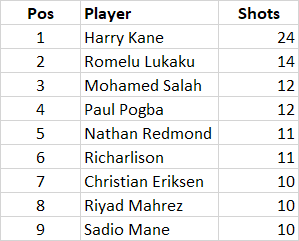 However, top of the list still, by a fair distance, is Harry Kane. He may not have scored but Harry Kane has been creating chances. Through a mixture of bad luck, and maybe some rusty early season finishing, he hasn’t yet converted in the Premier League. We’re only three games into the new campaign, and on this evidence, with time the goals will come. This entry was posted in General Thoughts, Statistics on September 7, 2017 by Jon @ AnythingButPenalties.